Thursday December 14th 1898 I left things in good shape for Charlie and we got up home before eleven oclock. I helped finish up the washing and visited the folks in the afternoon. Ida & Nellie are sill here. We are trying to be as brave as possible. Hattie & John are getting many beautiful letters. Will attended a couple of the meetings. 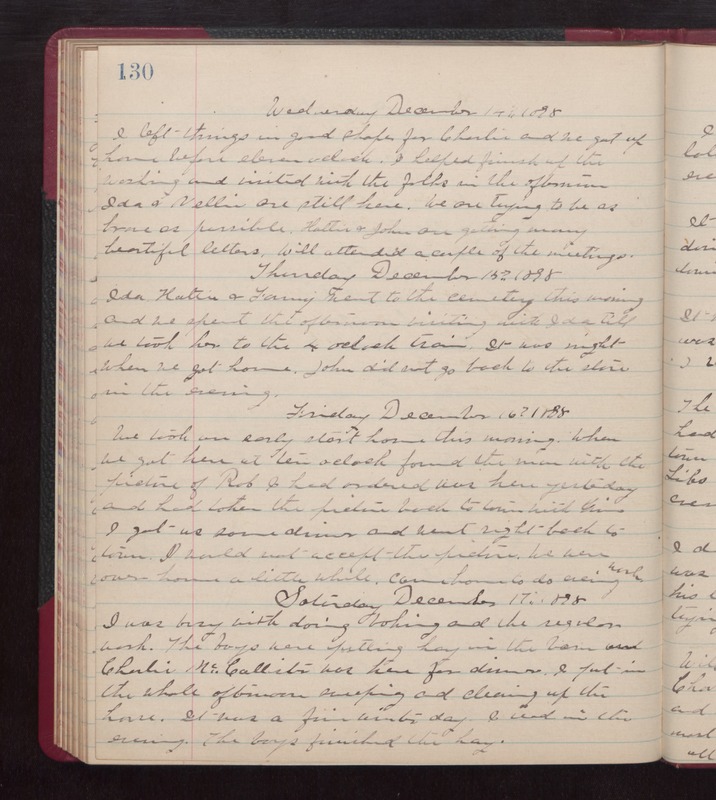 Thursday December 15th 1898 Ida Hattie & Fanny went to the cemetery this morning and we spent the afternoon visiting with Ida till we took her to the 4 oclock train. It was night when her got home. John did not go to the store in the evening. Friday December 16th 1898 We took an early start home this morning. When we got here at ten oclock found the man with the picture of Rob I had ordered was here yesterday and had taken the picture back to town with him. I got us some dinner and went right back to town. I would not accept the picture. We were over home a little while. Came home to do evening work. Saturday December 17th 1898 I was busy with doing baking and the regular work. The boys were putting hay in the barn and Charlie McCallister was here for dinner. I put in the whole afternoon sweeping and cleaning up the house. It was a five wintry day. I read in the evening. The boys finished the hay.